Brown Rusty Kitchen backsplash tiles come with different tackiness to create natural looks for your kitchen backsplash. 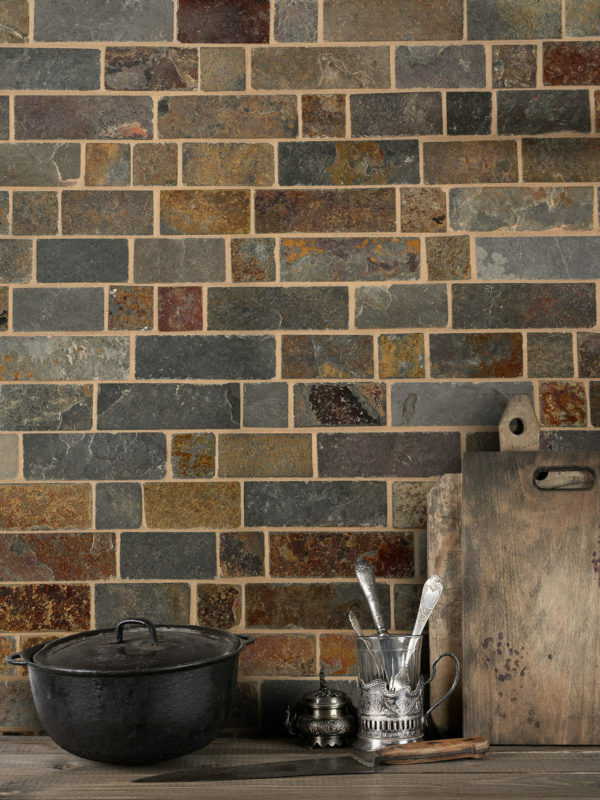 This backsplash comes with earthy tones like brown, rusty brown, gray and gold tones. Also, glass pieces added to create a shiny effect. Glass pieces are burgundy colors. 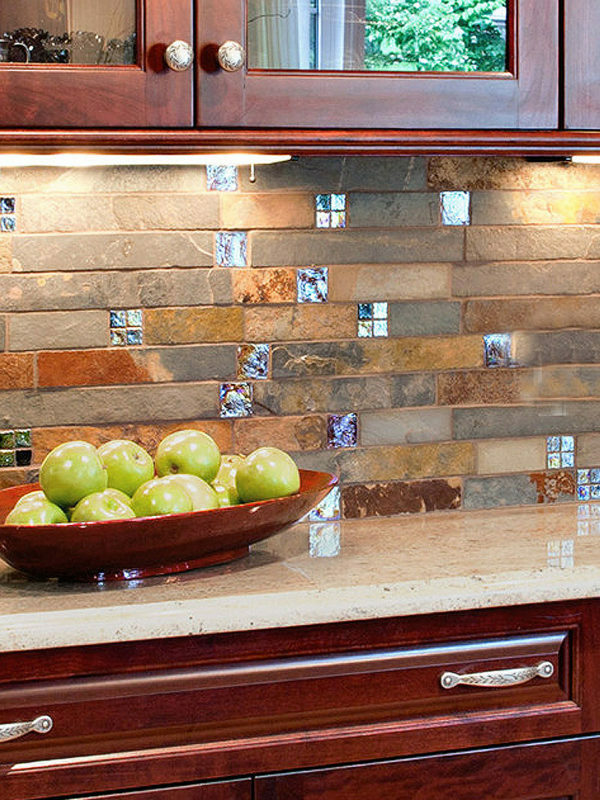 This backsplash tile can easily match with any burgundy or brown color kitchen cabinets and gold brown tone granite countertops. Red / brown color mixed quartz kitchen countertop, brown kitchen cabinets with slate and glass mosaic. Each burgundy glass comes with iridescent coating. That will give unique color changes effect under sun light. Each slate and glass mixed kitchen mosaic tiles comes with unique color combinations. Each mosaic is custom made. Since slate is a natural stone, each section color is unique and different than others. Since BA1026 is a custom made product, each installations is look different than others. Thats makes each kitchen is unique. 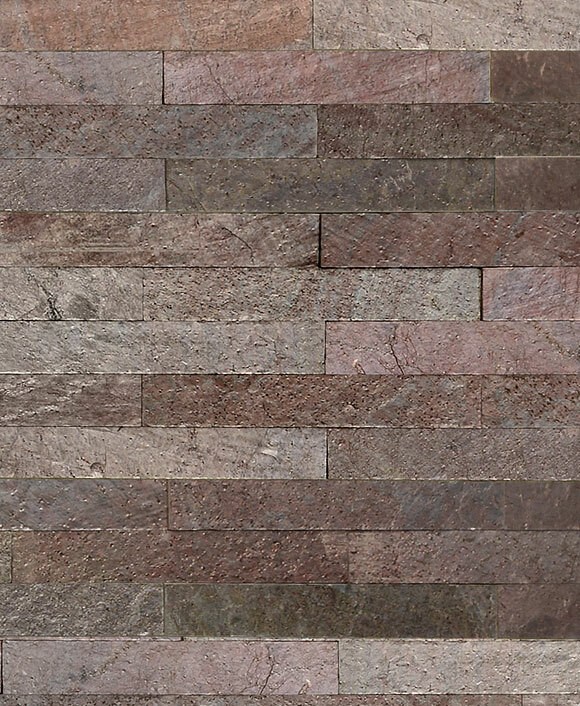 Slate mosaic comes with large and small size burgundy glass inserts. These inserts are comes with different tones of burgundy color. Custom made slate and glass mosaic comes with 3D look. Each section high is different. That makes look rustic & unique. We also provide custom made glass and slate kitchen medallion can match with BA1026 mosaic tile. Each slate and glass kitchen medallion made by order. That reason each kitchen medallion will look different. Slate and glass kitchen iridescent comes with 1×1 brown crackle glass & 2×2 iridescent burgundy glass for corner sections. Each medallion comes pre made ready to install. Also comes with bullnose edge for sides. BA1026 is also can be use for bathroom shower installation. Slate mosaic tile with white and green subway tiles. White and green subway shower tiles mixed with slate and glass mosaic tiles. Shower floor is 2×2 slate mosaic tile. Wood countertop design, traditional beige kitchen cabinets with slate and glass kitchen backsplash tile. Peacock Green granite kitchen countertop with oak brown kitchen cabinets, match with slate and glass kitchen backsplash tile. Modern look white shaker kitchen cabinets, Kashmir gold kitchen countertop mixed with brown cabinets and Volga Blue granite kitchen island. Black granite countertop with slate mosaic backsplash tile. Absolute black granite countertop with gray brown color mixed slate and glass kitchen backsplash. Green and black mixed ubatuba countertop with slate and glass backsplash tiles. BA1026 comes with gray and green/gray can easily match with ubatuba granite countertop. Red dragon granite kitchen countertop with rustic brown kitchen cabinets and slate tile flooring. Rustic kitchen red dragon kitchen island, brown kitchen cabinets warm color kitchen design. This entry was posted in BRICK, BROWN, GLASS, GRAY, MOSAIC, RED, SLATE, SUBWAY. Bookmark the permalink.